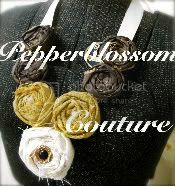 pepperblossom decor: Check them Out! at our home location in Mesa. We were lucky to work with a variety of vendors and products! We will be posting information so you can get ahold of these vendors for their awesome products! Robyn Bontrager "the Queen of all things Creative"
So cute!! I love making the ribbon ones with my girls!